Put away your paddles & swimsuits – this lesson isn’t poolside! Swimming can simultaneously be the easiest leg of any triathlon or multisport race as well as the most difficult. Why? Because it’s very dependent on technique & mindset. Developing these skills takes time, patience and determination. Luckily in today’s post we’ll dive into a little bit of everything (pun intended  ). Direction is critical in the pool AND in open water. Why? If you’re swimming off course in open water a 1500-meter distance can easily stretch upwards of 2000-meters or more! Practice swimming straight at a target, occasionally sighting from above the water line. Pick a target on the wall or pool deck and try to aim for it with each forward motion. If it’s a clock, try reading the time. Length comes in to play for building speed and more efficiency. Practice stretching and reaching your arms out ahead of you for the next stroke cycle. This allows more pull from your hands and forearms propelling you further along in the water. Imagine painting a house with brush strokes that only span six inches – it would take months. Now imagine painting that same house with four foot long brush strokes – seems more efficient doesn’t it? Catch is a simple fundamental element for your swim stroke. Imagine trying to catch a marble that someone throws at you with your bare hands. Now imagine trying to catch that same marble with a large baseball glove. Sounds easier right? The same thought pattern can apply in the water. Focus on relaxing your hands a bit (tight hand posture or open fingers don’t work well) and making your forearms drag as much water as possible on the pull. Fist drills sometimes help with this too. The more water your hands/forearms “catch” the more pulling power you have. 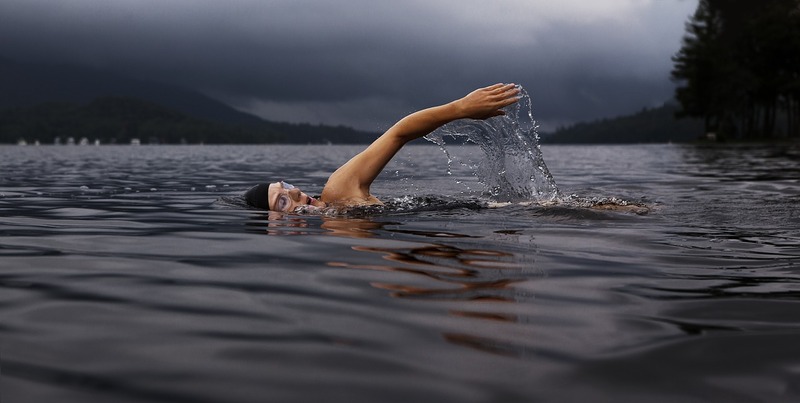 Mindset – Swimming, like much of triathlon or any athletic race, is mental. Poolside lessons and masters classes can be a little daunting at first – we’re all a bit self-conscious in our snug swimsuits, how do these goggles work, swim-cap or no swim-cap what the heck is a dolphin kick? We’ve all experienced this at some point when we first started out. Try to keep in mind – everyone else has similar feelings and thoughts! You’re all there to help each-other learn, grow and be better in the water. If you don’t feel that way after a few swim sets at your local masters class for example – talk with the instructor. Still not working? Find another masters class you’re more comfortable in. Open water swims add the element of fear & panic into all of the above noted concerns. Not knowing what’s below the waters surface (especially if it’s an open ocean swim) can wreak havoc on your mind. Panic of swimming off course or turning too soon/late adds to the mix as well. Two important things here are practice and patience. Always practice in open water prior to a race if you can – even if it’s THAT MORNING! Most events have a warmup circle you can spend a little time in to get comfortable in the water. Do this! It’s HUGE! Patience should be in the forefront of your mind as well. Starting out hard when the gun goes off is a bit inevitable, but unless you’re very confident in the water and plan to swim at the front of the pack – hold back a bit and stay off to the side a little. Allow people to swim around you or past you. Pick a pace and site line that works for YOU, not anyone else. Focus on breathing and staying calm while you settle into a nice steady rhythm. Elite Tip :: Join a local masters swim class. Often times it’s free or low in cost. This is a GREAT way to socialize in the pool, helping with comfort levels as well as gaining valuable knowledge towards your swim stroke & technique improvement. Swimming is the most skill dependent discipline for triathlon & multisport racing. Get feedback whenever possible from peers and coaches. Have a topic you want us to write about?? Maybe a tip for training better?? A group training activity you’d like to see organized?? Drop us a line and let us know!